Although I did not put on a lot of mileage today (about 10 miles), it was in other ways a satisfying day. 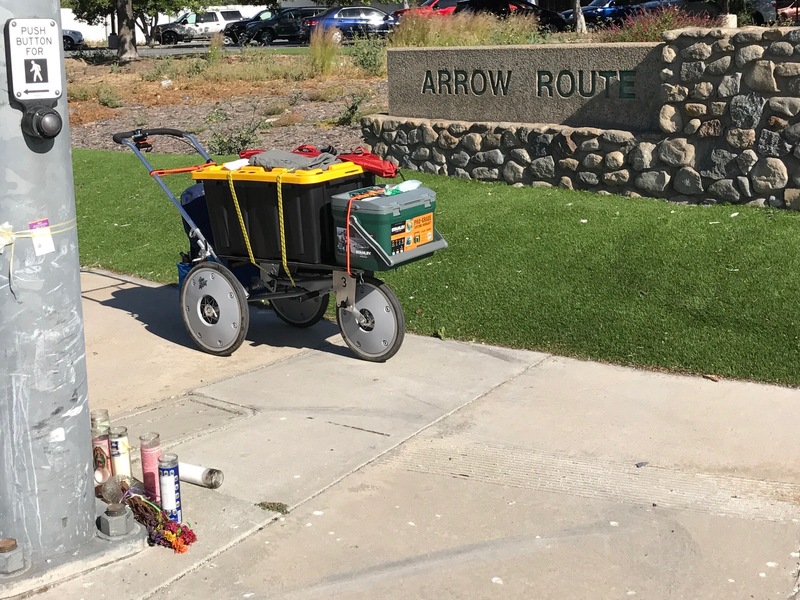 Although Haven Avenue in Ontario was anything but a haven yesterday when I was struggling to get past Ontario airport, it was more amenable today, taking me via sidewalks all the way to the very pleasant Arrow Route. (Note the candles at the corner.) I eventually moved a block or two north so I could walk along historic Route 66, after which the sidewalks again failed me. After a frustrating hour of backtracking, I was able to find my way to the Pacific Electric Trail, a wide, paved bike trail that was just a joy to walk on. By the time I got to Fontana, my feet were ready to call it a day. On my way to an inexpensive motel on Foothill Boulevard, I waved to a guy standing near a restaurant that was undergoing renovation. After a short conversation explaining what I was doing on my walk, Gustavo, who’s rebuilding this Tijuana-style taco restaurant, generously invited me to use the property to stay the night. So here I am. The neighborhood provides a strange mixture of Mexican music, truck and motorcycle engines, dogs, crickets and birds, and other city noises. I’m frustrated by my meandering route, but walking in Southern California is like that. The new shoes seem to be working. Although I’ve got some blisters on my toes, the knee pain was pretty much absent. No need for the rain fly on my tent tonight.